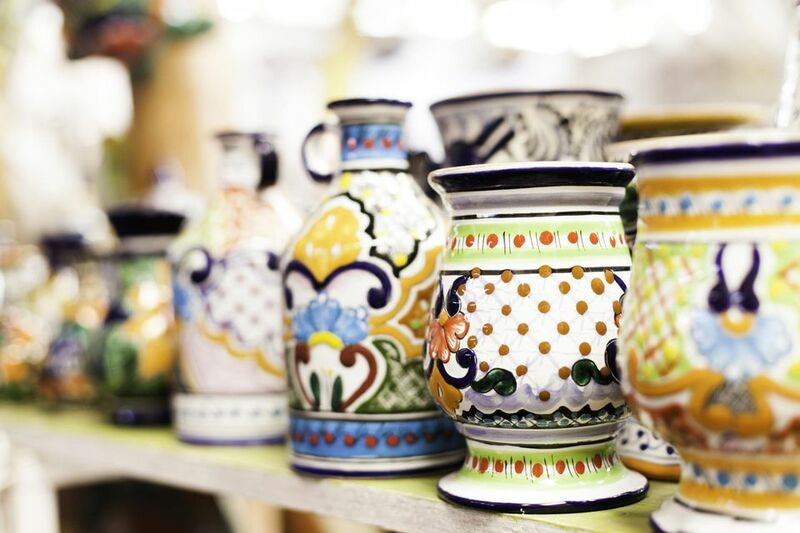 Colors in glazes are affected by the clay, slips, stains, or underglazes below them. Most ceramic colors, however, are a result of metallic oxides being dispersed in the fabric of the glaze itself. Under varying circumstances, these colorants can give very different results. There are a number of variables that can effect a glaze's color. These mainly fall within a group of three major factors. The composition of the glaze. This not only includes the colorants in the glaze, but also other glaze materials that interact and effect that colorant or combination of colorants. The temperature to which the glaze is fired. Some colorants are volatile and will dissipate into the kiln atmosphere if fired too high. Others give different colors at different temperatures. The kiln's atmosphere during firing and, in some cases, during cooling. Chrome oxide can yield a variety of colors: red, yellow, pink, brown, and especially green. Chrome is volatile at cone 6 and above and may jump from pot to pot causing streaks and smoky effects. Chrome-red: needs lead glaze fired at cone 08 or below. Extremely toxic; not for functional ware. Chrome-yellow: needs lead-soda glaze fired at cone 08 or below, or will begin turning green. Extremely toxic; not for functional ware. Chrome and zinc yield brown. Chrome plus tin yields pink, grayed pink, and warm browns. Color depends on proportions of these oxides in glaze and in relation to each other. Small amounts of chrome plus cobalt can yield teals at cone 9 and higher when fired in reduction. Magnesia glazes aid in producing nice colors. Cobalt is an extremely powerful colorant that almost always produces an intense blue. Cobalt carbonate tends to be used more by potters because it has a finer particle size and is less intense. In glazes with a high magnesia content, very small amounts of cobalt can give a range from pink through blue violet. Magnesia and cobalt in glazes fired at cone 9 or higher can yield blue mottled with red, pink, and purple. Very hard to control and duplicate due to the narrow temperature and atmospheric range. Cobalt and rutile can produce in mottled and streaked effects. Cobalt with manganese and iron will yield an intense black. In alkaline glazes, copper will produce turquoise. Copper yields a lovely range of greens in lead glazes. Copper increases lead's solubility. Toxic; not for functional ware. Copper in barium high-fired glazes produce intense blue and blue-green in both oxidation and reduction. Toxic; not for functional ware. Copper in low-fire raku glazes can yield metallic copper. Over time, however, the glaze will oxidize to green. Not many potters would challenge iron's place as the most important of the ceramic colorants. Iron's natural presence in most clay bodies produces clay colors ranging from light gray to deepest brown. Under clear glazes, iron-containing clay bodies can show a very similar range of colors. Iron-containing clay bodies that have been fired but are not mature, such as bisqueware, often are a salmon or yellowish pink color. If a pot is glazed with a lower-temperature glaze and fired below the clay body's maturity temperature, a salmon, ocher or reddish brown color will show through. Most iron used in glazes is introduced as red iron oxide (ferric oxide, Fe2O3). Yellow iron oxide is another form of ferric oxide; although its raw color is different, it is chemically identical to and acts the same as red iron oxide. Black iron oxide (ferrous oxide, Fe3O4) is courser and generally not used. Crocus martis is an impure iron oxide which can be used to produce speckled, rough, or spotty effects. Generally speaking, iron produces warm colors ranging from light tan and straw to deep, rich browns. High-fire glazes containing bone ash and iron can yield persimmon reds and oranges. Iron and tin in high-fire glazes result in a mottled cream color, breaking to red-brown in thin areas. Iron fluxes in reduction atmospheres. It is less active and can sometimes even act as a refractory in oxidation atmospheres. Iron in high-fire reduction can yield lovely, delicate iron-blue and celadon green. High-fire, high-iron content glazes fired in reduction will yield glossy dark brown or brownish black. In thin areas, the iron may reoxidize during cooling. Reoxidization will result in those areas turning red or gaining red highlights. Manganese is usually introduced into glazes as manganese carbonate. Black manganese dioxide is more often used in slips and clay bodies, where its coarseness yields spots and splotches. Manganese, when compared to cobalt or copper, is a fairly weak colorant. It is toxic; handle with caution, using all safety precautions. In high-alkaline glazes, manganese yields rich blue-purple or plum. At cone 6 and above, manganese produces brown. In lead glazes, manganses yields soft purple tinged with brown. Extremely toxic; not for functional ware. Nickel oxide, when used by itself, gives notoriously unpredictable results. It can be used to produce quiet grays and browns, but nickel is almost always used to modify and tone-down the colors produced by other colorants. Rutile is an impure titanium ore containing some iron and other materials. It is a very interesting colorant which is generally tan in oxidation and gray in reduction. Rutile encourages crystal growth in mid-range and high-fire glazes. It is well known for creating lovely streaky and mottled effects. In boron-containing glazes rutile produces pronounced streaks or spots, especially in glazes containing other colorants. In fluid glazes, rutile encourages opalescent blues. Antimony: used for yellow in low-fire glazes. Cadmium and Selenium: very similar, producing bright reds. Both burn out extremely easily. Toxic; not for functional ware. Gold: gives a range of pink, red and purple. Ilmenite: as a colorant, very similar to black iron oxide. Iron Chromate: produces shades of gray, brown and black. Iron chromate plus tin may produce a pink or reddish brown; if applied with a brush, can yield black hazed or haloed by pink. Toxic; handle with care. Silver and Bismuth: used in luster overglazes. Uranium Oxide: gives red, coral and yellow colors. Note: even fired into a glaze, uranium remains radioactive. Toxic; handle with care.